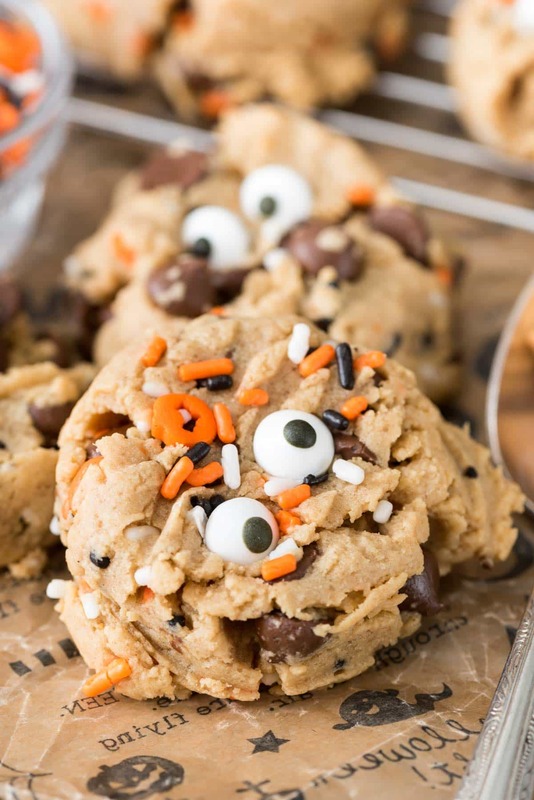 Peanut Butter Pudding Cookie Monsters – this easy peanut butter cookie recipe has pudding mix in the dough to keep them soft. I love this easy recipe, especially with chocolate chips inside! And you can turn them into monsters for Halloween! And somehow, just like that, it’s mid-October. Halloween is just a few short weeks away, the phone calls have started about where we’re spending Thanksgiving, and Jordan is planning our route for Black Friday shopping. As I’ve mentioned before…I’m not a Halloween person. I don’t like scary movies or scary costumes and I really don’t like trick-or-treating. What I DO love, however, is Halloween food. Mini candy bars that have no calories (right?) and candy corn creations and making bark with leftover candy. Don’t forget my favorite Halloween treat…food with eyes. I just can’t even, you guys. They look like they’re staring at me. That guy up there looks TERRIFIED, right? And the one behind him is totally giving side eye to something. If you’re looking to cuteifize (new word) any cookie, add some eyeballs. They take the “I want to eat you” factor up about a million, not that these cookies need it. I mean, they’re Peanut Butter Pudding Cookies. You don’t get much better than that! Have you made any of my pudding cookie recipes yet? They’re my absolute favorite. 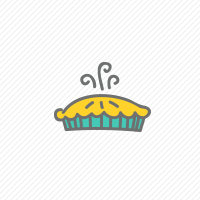 No matter what flavor you make, they stay soft for DAYS. I’m serious. Normally cookies don’t last long in my house but I forgot to give these away and was really trying to limit my cookie eating, so they were on the counter about 5 days before they disappeared…and they were as good day 5 as they were day 1. The base of the peanut butter cookie dough is, of course, peanut butter, but also the best thing in the world for cookies: butter. I love using Challenge Butter in all my recipes, because using good ingredients yields a better product. Combined with the pudding mix, these cookies are my favorite. I can’t believe I waited so long to make a peanut butter version! I also stuffed them with chocolate chips because, well, why not? I don’t think peanut butter is complete without chocolate, after all. 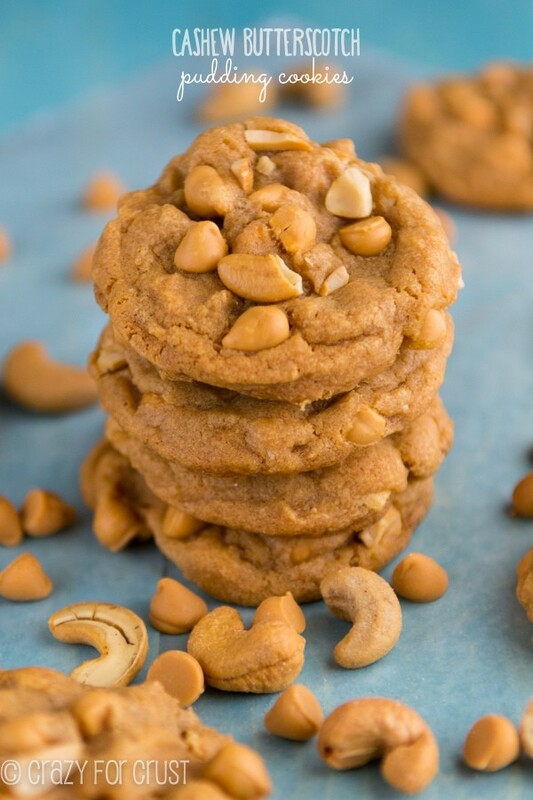 Peanut Butter Pudding Cookie - this easy peanut butter cookie recipe has pudding mix in the dough to keep them soft. 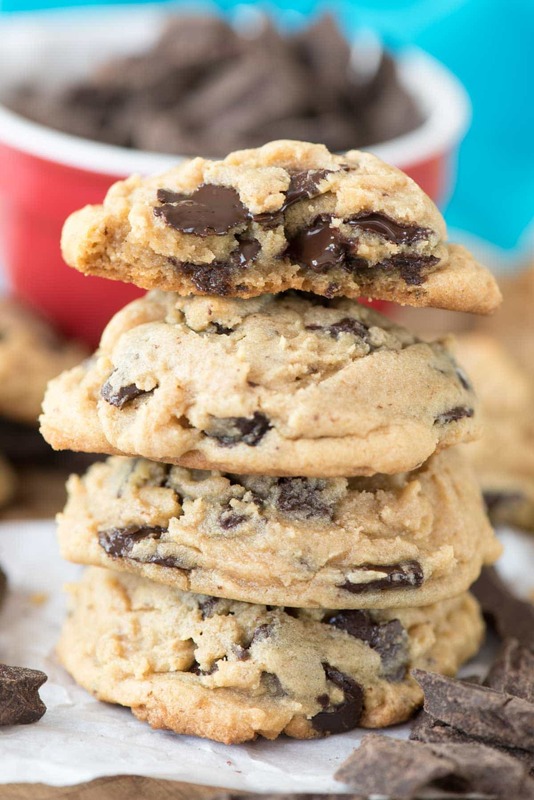 I love this easy recipe, especially with chocolate chips inside! And you can turn them into monsters for Halloween! 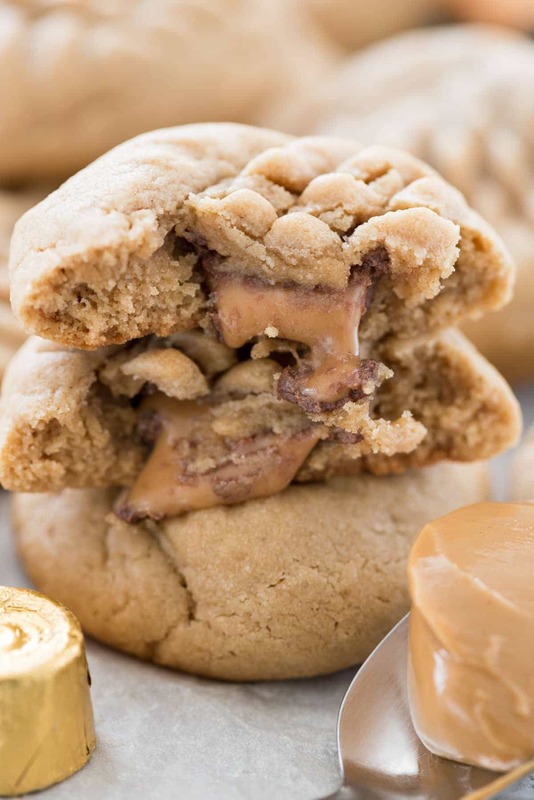 Cream butter, peanut butter, and brown sugar with a hand or a stand mixer until smooth. Mix in vanilla, egg, and milk. Add the pudding mix (the dry mix) to the batter and mix until combined, then mix in baking soda. Slowly mix in flour until the dough forms. Mix in chocolate chips and sprinkles. Scoop 2 tablespoon sized cookie balls onto prepared cookie sheets. Press them in a criss-cross pattern with the tines of a fork (as you would traditional peanut butter cookies). You can top with more chocolate chips or sprinkles, if desired to make them look more festive. Bake for 8-12 minutes or until the cookies are just no longer glossy on top. While the cookies are warm, press candy eyes in the top. Let cool completely before removing from cookie sheets. Store in an airtight container for up to 4 days or freeze for up to one month. This post has been sponsored by Challenge Dairy as part of my work as an ambassador for the brand. All opinions are 100% my own. looks delicious will try for sure for my friends . they love this . thanks dear for this lovely post . will going to share on my facebook with friends . These cookies were so much fun to make…easy directions and they look adorable with the candy eyes. Made these monster cookies today to send in a Halloween care package to my daughter who is in college on the other side of the country. They turned out so well and are adorable! My younger daughter who is still at home gave them a big thumbs up. I used butterscotch pudding to complement the peanut butter. 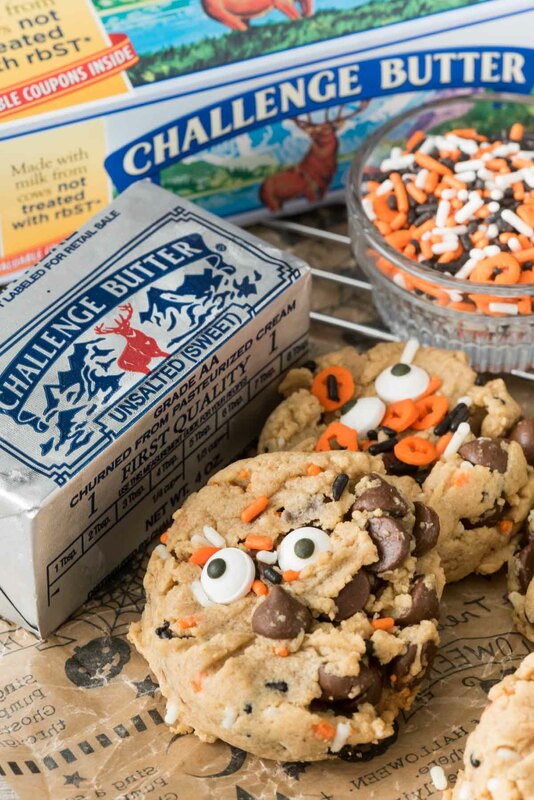 Thank you for sharing the recipe—these cookies might just become a Halloween tradition in our house!